Hello folks! 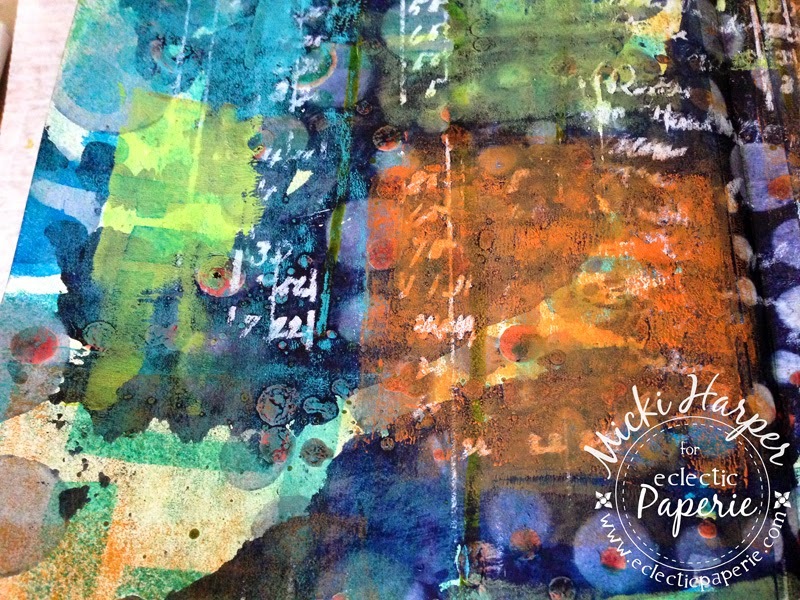 Micki here to share another fun (I think) art journal spread. It's been a long while since I've sketched a face or full figure person. So with an idea in my head, I grabbed my Dylusions Journal, opened to a blank page and applied a light coat of gesso with Ranger's Craft Scrapper. Next I grabbed a pencil and attempted to sketch a walking figure which didn't turn out so well. I could definitely tell that it's been a while since I had sketched. I couldn't get the walking legs right. So instead I grabbed some stencils and Dylusions Ink Sprays. 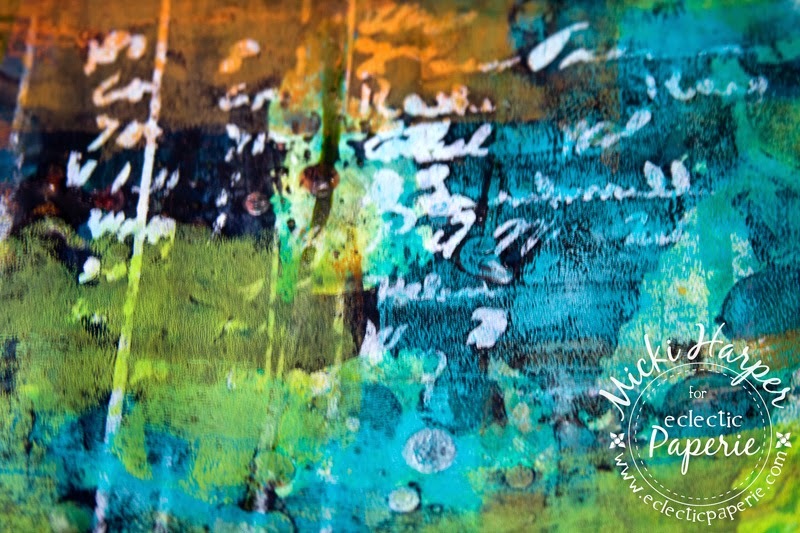 I started by randomly spritzing London Blue, Polished Jade, Calypso Teal and Pure Sunshine Dylusion Ink Sprays through a stencil from Stencil Girl. This was followed by a couple of spritzes of the White Linen spray. At this point I still had no idea what I was going for and delighted in just playing with the spray inks. 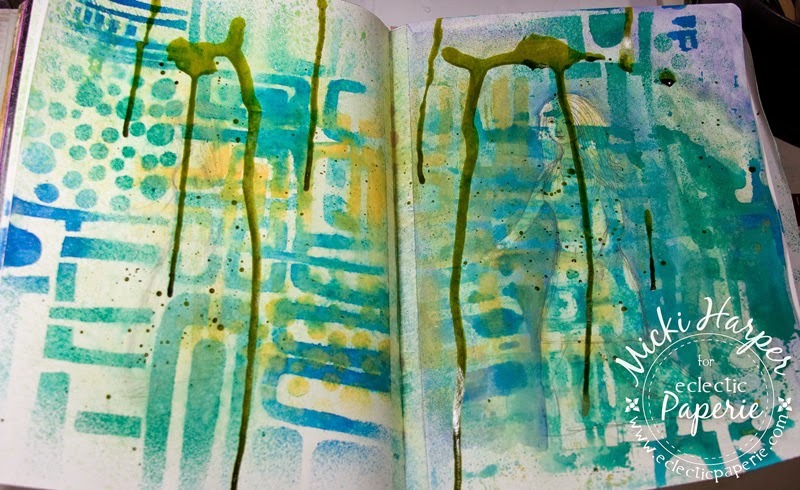 I decided to add some drips using some old Glimmer Glaze which I poured directly onto the pages. After this was dry, I decided I didn't really like it. Not enough contrast and I could still see my previously sketched figure through the inks. 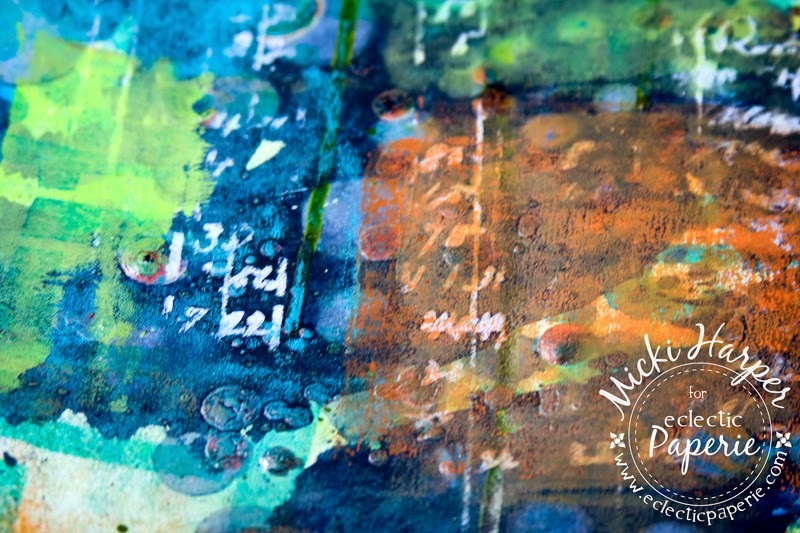 Out came Dina Wakley's Heavy Bodied Paints and my Brayer. 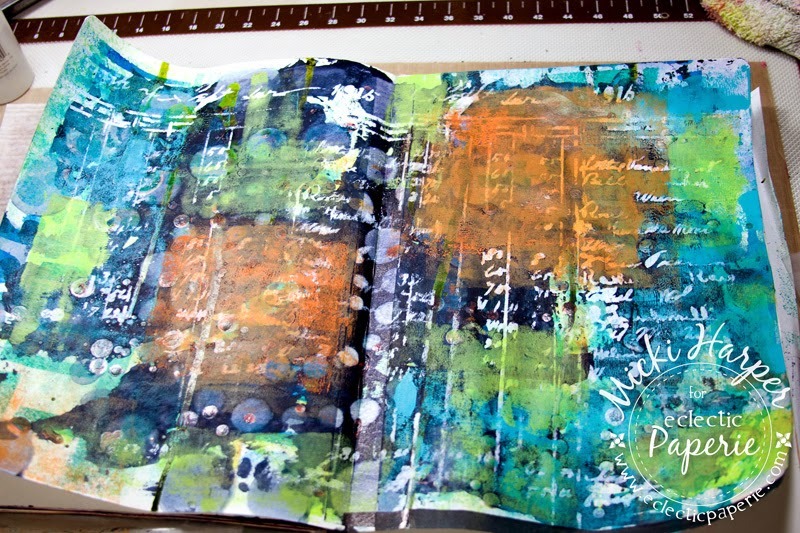 Seriously, you can not go wrong with brayer play! I also did some stencil reduction using Prima's Elementals 12x12 stencil, laying it over the still wet paint and removing paint with a baby wipe. Next... some more brayering. I added some contrast with Dina's Heavy Bodied White paint and TCW's Ledger stencil followed by..... you guessed it, more brayered paint. Now I was in love. I loved the bold colors and all the contrast. And the longer I looked at it, I thought I saw a face silhouette peeking out at me. 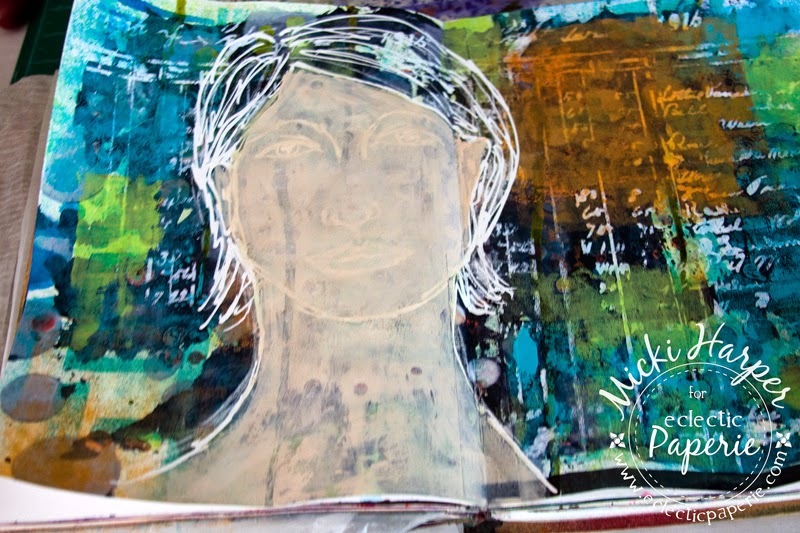 I had taken my art journal with me to work when I decided that I would try to paint a face where I saw the silhouette. Since I had forgotten my bag of pens and pencils, I opted to use a fine point Presto Correction Pen from Pentel and loosely drew a face. Once I got home, I created a flesh like color by mixing white, a little Magenta, Lemon and Umber. To get the flesh color, I always start with white, then adding teeny amounts of Umber, Lemon and Magenta, as well as some water. I keep adding and mixing until I think I have a close "flesh" color - there is no exact measurements, I just keep mixing! Because I had watered the paint down, it took several coats. Once that was dry, I used my pencil to sketch over the features and face outline (ears). Next I added Faber-Castell Gelatos which not only helped to provide more opacity but also gave the face some depth. The gelatos were blended with a slightly wet brush, using the lighter neutral colors as well as the yellows, blending these with the white gelato. For shading, I added the darker hues (from the neutral and yellow packs) along the outline of the face. On the cheeks and lips I used Faber-Castell Gelatos from the Red color pack. And for additional shading, Big Brush Markers were used which were blended with my fingers. The hair was filled in with Dina's Umber paint as well as some black Gelato. The great thing about using the Correction Pen is that the lines still show through the paint and I love to incorporate the pencil lines because when water is added, the graphite tends to smear, which is perfect for shading. I added the only word that had been stuck in my head, using my black Ohto Fude Liquid Ink Roller Ball pen. After I made sure that the ink was completely dry, I filled in the letters with white paint, followed by touch ups with my white Big Brush Marker as well as the orange marker (for the outline). Lastly, I added Chipped Sapphire Distress Stain around the edges. It's not my best face. Her face is a bit long but I do like how she turned out, long nose and all :-). 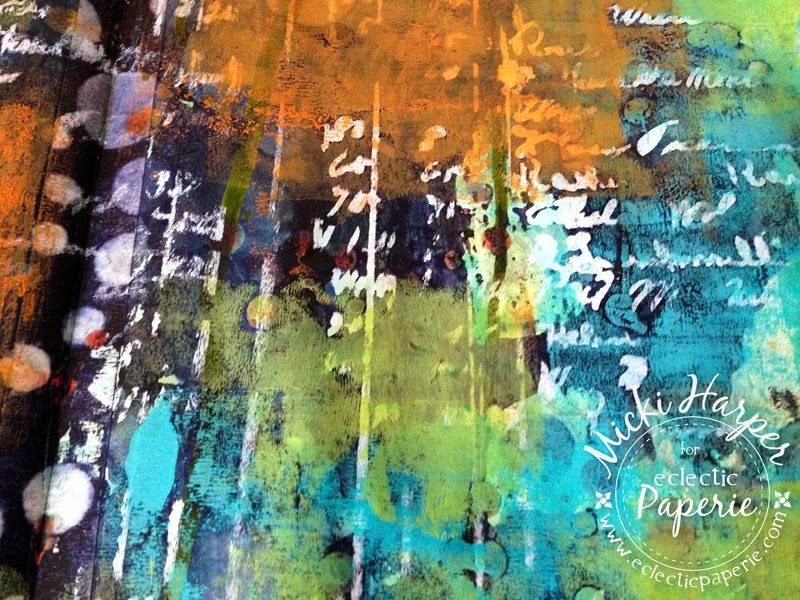 And if you ever need some therapy, you know the kind to take your mind off things, grab some paper, your brayer, paints, stencils and ink sprays and don't worry about the end result! That my friends is indeed the best form of therapy I know!!!! I hope you were inspired and I hope I made sense! It's so easy to get "into" the moment when creating art, don't you think? Thanks so much for stopping by! My goodness Micki! 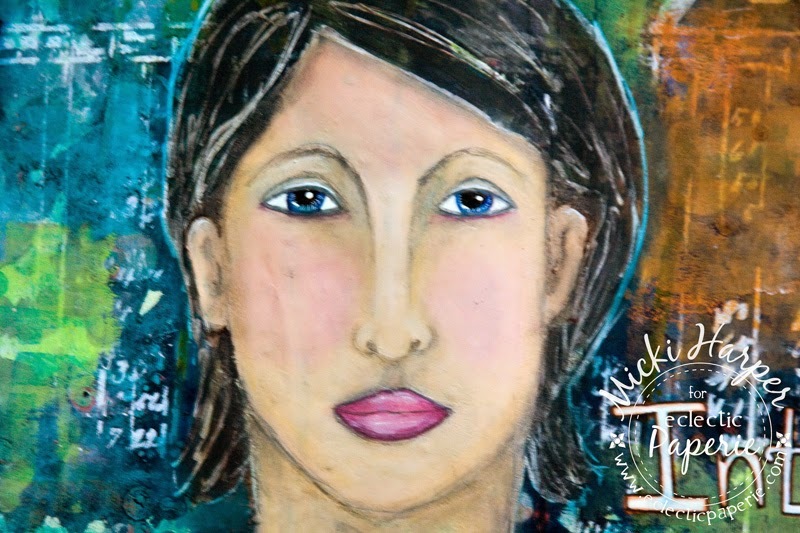 what a wonderful process and fabulous end results - love the colors and lines in your background and that marvelous face! Thanks for showing us all the steps and changes of direction you took in your creative process! Micki, LOVED seeing your process and was amazed when you used gelatos on the face, how much depth it added! Don't you LOVE Dina's heavy body paints?! 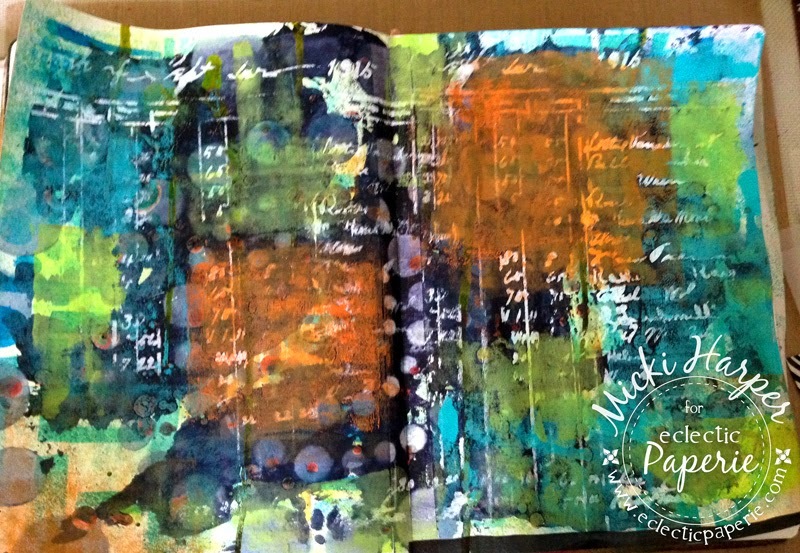 LOVED how I saw the "face" in your journal BG and then how you created it right there! LOVE this! Micki - I think this is amazing...your face is beautiful and the background stunning. Fabulous work, girlfriend!!! Wow, this is lovely. your face is amazing. This is amazing! I always find inspiration in your work. 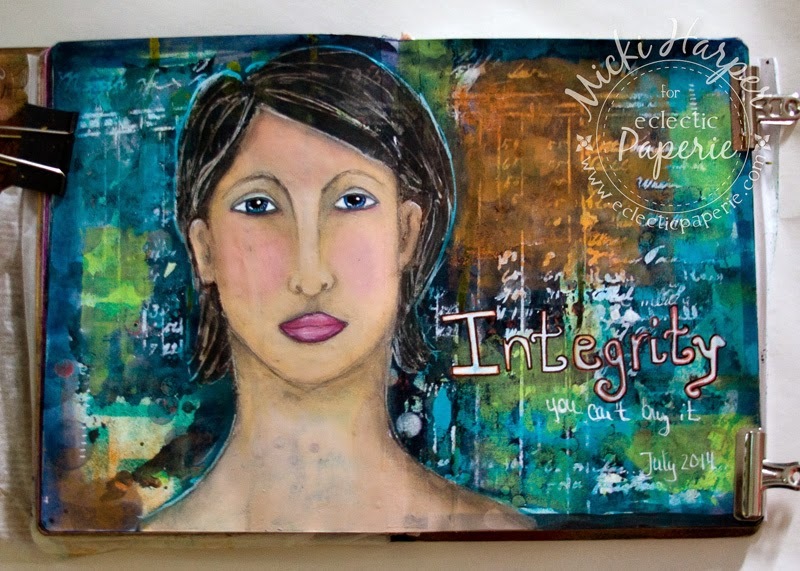 Of course, it muddles quite a bit on my projects but none the less, I am inspired!! !